Eight Eleven will be on April 3 to interview for their Recruiter and Sales Executive positions. You must submit your resume on Handshake by March 24th to be considered. Eight Eleven and their family of brands take a great deal of pride in establishing happy, successful, and long-lasting relationships with their candidates and clients across all industries nationwide. They provide companies with consultants to support their business needs, all while helping people discover new avenues for advancing their careers through temporary, full-time and contract-to-hire job opportunities. Their recruiters and sales executives are ambitious and self-motivated individuals who take initiative and guide others to provide the best quality service for their candidates and contractors. They visualize their career as an opportunity to grow their own network of candidates and maximize on relationships, as well as, grow within the company. 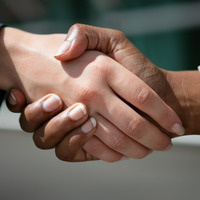 Their recruiters have ability to connect on a professional and personal level with clients, candidates/ contractors, and teammates. Most importantly, they have a desire to take on additional responsibilities, create new positions and opportunities, and help Brooksource expand across the country. 2. Upload your resume to apply for on-campus interviews. Please contact Tina Haynes with questions about this opportunity. Find more opportunities like these through Handshake! Complete your profile to personalize your job/internship feeds, upload your resume, sign-up for on-campus interviews, practice interviews, career fairs, networking events, workshops and more!